What does it mean to be intelligent? How can we open doors to inclusive education and employment? Come to a screening of INTELLIGENT LIVES with filmmaker Dan Habib this September. NEW YORK CITY National Theatrical Premiere! Get your tickets today before these events sell out! Daily life moves quickly. But some moments deserve reflection. This past week we had such a moment, with the funerals of Aretha Franklin and John McCain. Detroit engaged in a week-long celebration. Neither the 6-hour concert, nor the 8-hour funeral could fully encompass the generous, soaring gift of the life of Aretha Franklin. She loved Detroit. And Detroit loved her back. Throughout the funeral, much of America learned about the life of a woman who represented what is best in us: generosity, commitment, family ties, faith in people, and purpose. Hour after hour we heard about the qualities of life that matter, qualities missing in our public lives. Franklin’s funeral was followed the next day by that of John McCain. The Senator orchestrated his own funeral to send a political message. Unable to defeat Trump in life, he made one last effort. Funerals have long been focal points for political action. Whatever their contradictions, tyrants fear them. When public spaces become brittle and restricted, the democratic impulse finds new forms of expression. Historically funerals have been transformed from private grieving to calls for public action. Consider the funeral of Emmett Till. In 1955, 14 year old Till was murdered in Mississippi and his body dumped into the Tallahatchie River. She wanted to “put that body on display for five days and people could walk by and see what racism had really generated.” Jet magazine and the Chicago Defender published the photo of Till’s body. Thousands of people walked by the open casket in Chicago. Most historians agree that this moment helped push America forward into the civil rights movement. 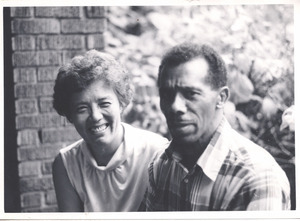 People defied the ban, ultimately toppling Apartheid. Throughout the 1980’s and 1990’s it was at the funerals of gay men that the queer community was forced to articulate the meaning of our lives and relationships, again, again, and again, often in the face of hostility. Such moments require us to define values that matter, values we aspire to for ourselves and our communities. Far more than legal actions or anonymous letters, these moments, where we grapplewith the meaning of our lives, call upon us to reflect on who we are, who we want to become. They have the power to change us. Petty Propolis hosted its 1st Annual Art Festival and Artist Retreat in Historic Idlewild, Michigan this past Labor Day weekend. As an artist and social justice organizer, I understand that I stand on shoulders and that a lot of those shoulders believed in, organized in, loved on, and performed in Idlewild. Those shoulders include W.E.B. Dubois, Madam C.J. 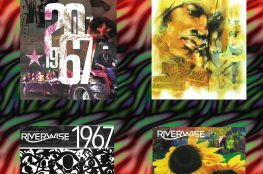 Walker, Della Reese, The Four Tops, Jackie Wilson, Etta James, our recent Ancestor Aretha Franklin, and many more. It was only fitting that we would watch portions of the Queen of Soul’s home-going ceremony at the start of the festival and retreat in Idlewild, at the Red Rooster, while playing her music on the jukebox. It was an honor to be afforded an opportunity to bring 40 Detroit artists to experience what I experience whenever I have the opportunity to spend time in Idlewild. It is a soul growing and transformative experience each time. During the retreat portion of the Petty Propolis Art Festival & Artist Retreat, the artists skill-shared through workshops, spent time mending fractured relationships, created new ones and meditated in the healing waters. During the festival portion, they performed for two days for the Idlewild community at the Robert Riffe Youth Center, also known as The Idlewild Lot Owner’s Association. In addition to all the incredible talent that graced the stage in Idlewild, Dr. Gloria House (Mama Aneb Kgositsile) led two mornings of history workshops based on her book on Idlewild, Home Sweet Sanctuary. Baba Jamon Jordan of Black Scroll Network History and Tours, and Micala Evans of Historical Idlewild Tours led the artists on mesmerizing, physical journeys through Idlewild history. 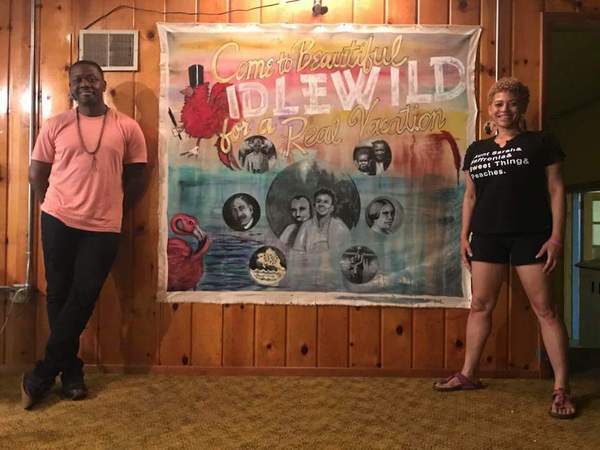 Tylonn Sawyer and Sabrina Nelson live painted an incredible artistic tribute for the Idlewild community, based on a historic “Come to Idlewild” Brochure, ca. 1955 (Ronald Stephens Collection), that used to promo the Black resort. It has been a dream of mine for many years to attend an artist retreat. It has been an even bigger dream to create one for others. 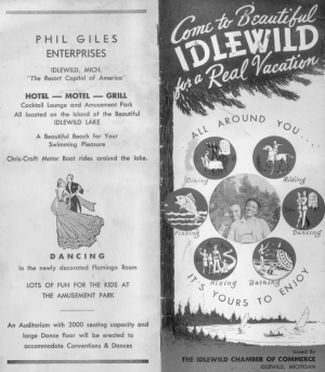 I could not have imagined years ago that either would happen in Idlewild. This year with the support of the Radical Hope Fund and the New Economy Coalition’s regranting program, I was able to make both come true. New collaborations were fostered. New projects were innovated. Mental, physical and spiritual healing was realized, and we poured resources into Black owned businesses that valued our support, like the Historic Morton’s Motel. This was especially timely, as the Idlewild community and the surrounding areas had suffered a powerful storm and massive power outages, just days before our arrival. We were honored to offer our talents as a bit of relief at such an important time, in such an important place. Look for more to come from Petty Propolis — a sponsored project of Allied Media Projects. Seventeen years ago, I made a simple decision that saved my life. I was a cook at the Windows on the World restaurant, and my colleague Moises Rivas asked me to switch shifts with him. I agreed, and Moises took the morning shift. Along with 72 of our friends working in the restaurant that day, Moises perished when a plane struck the 92nd floor of the North Tower.On the day of the attack, I was with my wife who was 8 months pregnant. I received a call from the wife of one of my coworkers who was seeking my help to reach out to her husband in the building. Following the tragedy, I would visit the hospital every day, searching for him. I decided that I no longer wanted to work in a restaurant. I took jobs as a security guard and then as a cab driver. Along with others who struggled with grief and financial hardship, I volunteered at a relief center that was formed by HERE Local 100 in order to support displaced restaurant workers. From this effort — and from the ashes of the magnificent Windows on the World restaurant that had been destroyed and all the lives that had been lost — Restaurant Opportunities Center of New York (ROC NY) was eventually born. Co-founded by Fekkak Mamdouh, a former waiter at Windows on the World, and Saru Jayaraman, President of ROC United, ROC NY was formed to champion the rights of New York restaurant workers. In 2008, the team expanded into chapters in cities across the country and launched Restaurant Opportunities Centers (ROC) United, which has grown into a national organization with members who work in restaurants nationwide. I joined ROC in 2003 and now am proud to serve as its Executive Director. As you know, ROC United’s mission today is closely aligned with its origins — promoting equality, financial stability, and safe workplaces for hard-working restaurant professionals nationwide. Women of color and immigrants are particularly vulnerable members of the population of 13 millions workers in the industry. Nearly 40 percent of female restaurant workers are women of color, while 23 percent of all restaurant workers are immigrants. Since 2013, the organization has been leading the One Fair Wage campaign—a project that educates about and advocates for raising the exploitative subminimum tipped wage to the full minimum wage across 42 states, some of which still pay tipped workers an unimaginable $2.13 per hour. Just last week, Michigan became the eighth state in the Union to phase out its exploitative subminimum tipped wage, joining California, Oregon, Washington, Alaska, Nevada, Montana, and Minnesota and two municipalities, Washington, DC, and Flagstaff, AZ. On this anniversary of 9/11 and of our founding, my colleagues and I invite all consumers, workers, and employers to pledge support for women, immigrants, and people of color working in some of the lowest paid occupations and to demand wage increases and fair labor practices across the restaurant industry. We are profoundly grateful to all of you. P.S. Pledge your support by clicking here.